Having construction work done on a property requires a lot of trust be put in the contractor. In many cases, the project is completed according to the specifications and within a reasonable time. In some cases, however, this trust is shattered when the contractor does not fulfill his/her requirements under the contract. Retaining the services of an experienced construction law attorney, especially one having experience in drafting and negotiating construction contracts, can be valuable if and when a problem occurs. Recently, a homeowner had to resort to having an investigative journalist obtain compensation on his behalf when a court ruled that a roofing contractor he hired did not honor a ten-year warranty on a brand-new roof they installed for him. A discussion of deadlines facing enforcement of construction contracts, as well as the types of warranties applicable to these relationships, will follow below. As with all legal actions, the Florida Legislature imposes a time limit on how long a party has to initiate a lawsuit. This is known as the statute of limitations. For construction projects, Florida’s statute of limitations requires that any action founded on the design, planning, or construction of an improvement to real property must be filed within four years of the later of the date of actual possession by the property owner, the date of the issuance of a certificate of occupancy, the date of abandonment of construction if not completed, or the date of completion of the contract or termination of the contract between the professional engineer, registered architect, or licensed contractor and his or her employer. Warranties generally define the liability and limitations of a contractor for construction defects that arise during and after a construction project. Accordingly, a breach of a warranty occurs when a contractor does not fulfill its contractual warranty obligations. Warranties can be of two types – express and implied. Express warranties are those that are specifically set forth in the construction contract, and, most typically, includes specific promises or guarantees of quality standards and workmanship. As an example, a typical express warranty in a construction contract will state that the construction project that is to be performed will be free from defects for a certain period of time and conform to contractual obligations. Alternatively, the construction contract may provide a general warranty of quality, which is a guarantee that quality materials and due care will be used to complete the construction project. Implied Warranty of Good Workmanship. Similar to a general warranty of quality, this implied warranty guarantees that the contractor will provide services in a diligent, reasonably skillful, and good workmanlike manner. It is noted that this warranty, in fact, does not guarantee that the result of the construction project will be perfect, just that the project meets an industry standard. Implied Warranty to Construct According to Plans. This implied warranty ensures that the construction project is completed according to the plans agreed to between the property owner and the contractor. In order to obtain relief pursuant to this implied warranty, the plans must be filed with the local governing authorities. Violation of any of these warranties may subject the contractor to liability for any damages caused to the property owner. An experienced construction law attorney can help determine whether a violation occurred. 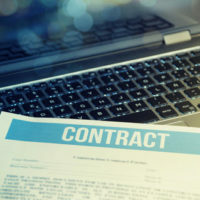 If you entered into a contract with a construction company, and the construction company violated a warranty of the contract, contact an attorney experienced in construction law as soon as possible. The attorneys at Linkhorst & Hockin, P.A. have years of experience dealing with construction contract disputes, including violations of warranty of contract. Based on this experience, we will review the circumstances of your case, and, if we believe you have a viable claim for a warranty violation, will help you plan the most effective strategy to obtain compensation for your troubles. Contact our Jupiter office today.